This picture really tells the story. 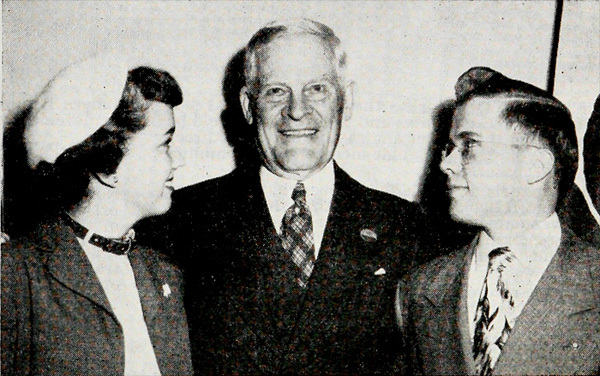 DiAnne Mathre of Illinois and Dwight E. Nelson of Iowa, top Citizenship boy and girl at the 1949 National 4-H Congress stand with Thomas E. Wilson. The awards were made in honor of Mr. Wilson. The deep admiration of Thomas E. Wilson by the Congress delegates for four decades is reflected in the faces of these two winners. For tens of thousands of 4-H delegates who journeyed to Chicago for National 4-H Congress and the International Live Stock Exposition, you needn’t say anything more by way of explanation. Thomas E. Wilson Day says it all. The much anticipated annual event was unique. It was thrilling. It lived up to all expectations. And, no one enjoyed it more than Thomas E. Wilson – the man who planned it. The man who paid for it. Thomas E. Wilson Day actually started before National 4-H Congress. The very first one – held by happenstance – occurred on December 6, 1916 during the International Live Stock Exposition – the largest livestock show in the world, held annually at the Chicago Union Stockyards. During that year’s Exposition Thomas E. Wilson had come to view the cattle. He owned one of the top herds of Shorthorns in the country. He happened to see a group of club boys examining the exhibits and stopped to talk to them. He saw that they were keenly interested in what they were viewing. Years later, Wilson recalled, “I thought perhaps I could help them in some way.” He started that very day by inviting the 11 boys and their leader to lunch with him. Little did he anticipate that these few boys and their leader, breaking bread with him over lunch, would grow to an annual event with well over 2,000 in attendance and continue for over 40 years. So who was Thomas E. Wilson? In 1917 he was hired to take over the management of a failing meat packing company in Chicago, which was subsequently named after him, making Wilson and Company the third largest meat packing company in the country. In 1926 he created one of the most recognizable brand names in the world, known as Wilson Sporting Goods. He served as President and Chairman of the Board of Wilson and Company for 35 years. He was one of a small group of businessmen who created the National Committee on Boys and Girls Club Work (forerunner to National 4-H Council) in 1921 and served as the National Committee’s president for 34 years, from 1924 to 1958, the year he died. He was one of the greatest friends in the long 4-H history. By 1921 National 4-H Club Congress was established, held at the same time as the International Live Stock Exposition, and Thos. E. Wilson Day became a key event of the Club Congress. Mr. Wilson thrilled in being the special host to these boys and girls from across America and he wanted to give them new experiences for them to remember for many years to come. The dissertations on meat packing evolved in a Thos. E. Wilson Day of tours and a huge banquet, music and entertainment, and was especially noted for its guest appearances — people like Explorer Admiral Richard E. Byrd, Amelia Earhart, Ted Williams of the Boston Red Sox, Chicago Bears Quarterback Johnny Lujack, professional golfer and Olympic gold medalist in track and field Babe Didrickson Zaharias, Hollywood stars Dennis Day and James Cagney and others. One of the highlights of the 1948 Thos. E. Wilson Day party was the first national preview of Walt Disney’s new motion picture, “So Dear to My Heart” with the personal appearance of the boy star, Bobby Driscoll. In later years an impressive Thos. E. Wilson Day printed program was distributed. Several copies of these have been digitized and are in the Print archives on the National 4-H History Preservation website. This entry was posted in History and tagged Thomas E Wilson by Larry Krug. Bookmark the permalink.